Tiki Buzz's official artwork for Donkey Kong Country Returns. The Tiki Buzz (ティキドリー, Tiki Dolly) is the main flying enemy encountered in Donkey Kong Country Returns. Tiki Buzzes debuted in Donkey Kong Country Returns, and are the equivalent to the Neckies of previous games. They are weak flying enemies that can be jumped on as makeshift trampolines, destroying them. Tiki Buzzes often fly in fixed patterns, and they come in multiple varieties. Two such varieties are set ablaze, and require Donkey Kong or Diddy Kong to either blow out the fire surrounding them, or throw a barrel at them. A Tiki Buzz in Smash Run. 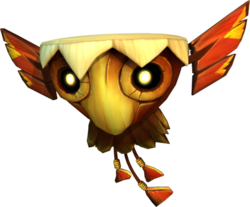 Tiki Buzzes appear as enemies. They fly around, position themselves above the player and attack by slamming into the ground. After a short while they fly back up. They can be attacked normally but, like Goombas, jumping on them defeats them instantly, even giving the player a huge vertical boost, like a Spring. A large number of Tiki Buzzes can appear as a random event. Tiki Buzzes appear as part of the Donkey Kong-themed waves of the generic Vs. Enemy Team final battle. This member of the Tiki Tak Tribe appears in Donkey Kong Country Returns. It'd be really tempting to see what kind of sound that drum-shaped head of his would make. In Smash Run, they do a dive-bomb attack if a fighter passes below. You can bounce off their heads to boost your own jump! A drum-shaped, bird-like creature from the Tiki Tak Tribe. In Smash Run, they float around in the air, and if they end up above you, they'll suddenly drop down, right on your head. Jump on them instead, though, and you can bounce off and go flying through the air. So think twice before you tell these guys to buzz off! This page was last edited on November 13, 2018, at 16:01.